Kidfresh Frozen dinners while enjoying Disney's Frozen movie #FrozenKidfresh | DaDa Rocks! 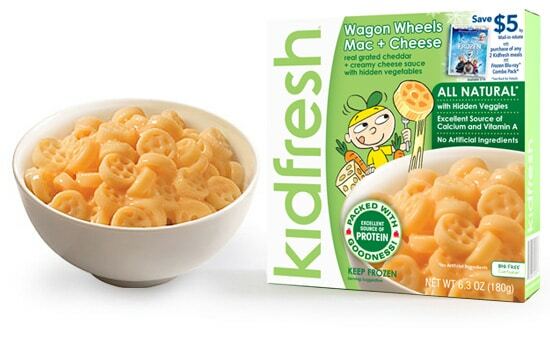 A while ago we discovered Kidfresh meals for my son… he loves them… Wagon Wheels Mac + Cheese and the Muy Cheesy Quesadillas are his favorites. The meals are actually fairly healthy and he loves them. When you have a picky eater (and we all know that at some point your kid will be a picky eater). These have been AWESOME! I could go thru a list of 20 things for dinner some cooking, some ordering in, but whenever I get to the KidFresh item in the freezer that’s usually the end of the discussion. Whats better then dinner and a movie? how about a Frozen dinner while watching Disney’s Frozen on BluRay. Kidfresh has a special offer for a $5 rebate when you purchase any 2 meals and the Frozen BluRay. Here are some awesome activity sheets like a Frozen coloring page or a Frozen maze and puzzle sheet. Nothings better then a family dinner where the kids actually eat and then we turned on Frozen and enjoyed one of the best Disney movies since Lion King.